I found a technology online that uses the Application level of Bloom’s Taxonomy. 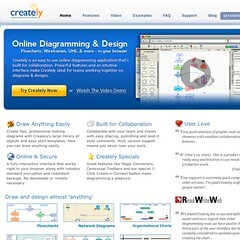 Creately is a free website where students and teachers could go to create diagrams, graphs, and other visual designs. Teachers could use this service to create nice worksheets for students and students can use the many features to work on a project. While I was reading about Creately, I was thinking about how I could use this is my classroom. Besides having students use this site to create projects, I was also thinking of it benefiting my students to make diagrams about a novel they are reading. It really speaks to the Application of Bloom’s Taxonomy because it is all about applying knowledge to a project and it can help students remember many facts about a lesson. Creately is a way for students to apply knowledge or facts in a different way. I think this technology could really benefit children in remembering new knowledge because it requires them to bring all the facts into something like a graph. Creately does have some pricing options on this site, but the diagrams, project, and collaboration (an application that allows students to work together on a project) are all free, and that is what I found most important for the students to have access to. This entry was posted in Uncategorized and tagged EDFI560SM1210. Bookmark the permalink.